Mechanical locks on both front and rear attachment pins are separate from hydraulic system. JRB's Power Latch multi-pin grabber coupler is one of the safest, most advanced couplers of its type for excavators and loader backhoes. Designed by Miller UK Ltd., and made by Paladin, the coupler features a patented automatic blocking system that ensures engagement is maintained during hydraulic failure. Designed to work with a wide range of buckets and attachments, the JRB PowerLatch boasts reduced offset, light weight, and one of the strongest strengths in the industry. JRB PowerLatch multi-pin grabber coupler is one of the more advanced couplers available. The unit features mechanical lockup on both front and rear attachment pins that are independent of the machine's hydraulic locking and operation system. 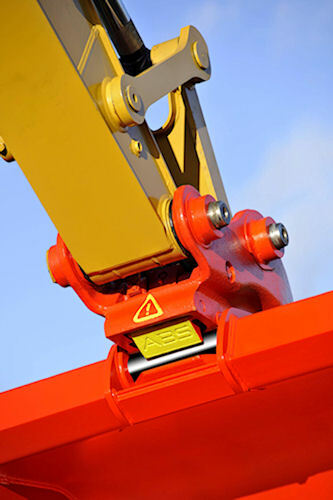 If the rear bucket pin is not correctly engaged, or missed during the attachment process, the ABS automatically secures the front attachment pin. Attachments can only be removed under operator control when they are in a safe, curled position -- preventing accidental release of the attachment. In addition to the safety considerations, the PowerLatch includes a reduced offset to allow greater breakout force. Also, ports connecting the hydraulic hoses to the coupler are located on top of the cylinder, making installation much easier than some competitors. For more information, visit www.paladinconstructiongroup.com.